In the inner Himalayas of Bhutan, located at about 3000 meters above sea level, is a wide alpine wetland called Phobjikha. The wetland is an interesting and unique valley, located like a bowl amidst the tall alpine mountains. When the snow melts on the high peaks, the spongy valley becomes a wetland teeming with birds. 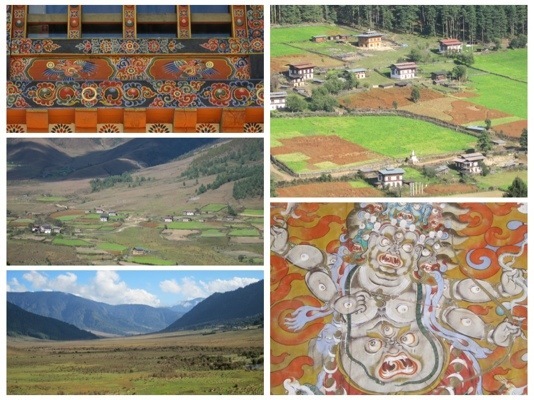 For many hundreds of years, this sunny valley enjoyed a harmonious co‐existence of its inhabitants with nature. The local people are practicing Buddhists with a long tradition of respect for all sentient beings. They do not engage in killing animals, even for their own food. It is much more common to see general stores with long strings of dried yak cheese, butter and milk, than to see butcher shops. Their respect for bird life has made this valley a favorite wintering ground of the rare and endangered Black‐necked cranes. Every year, the Black-Necked cranes migrate from Tibet to Bhutan where it is warmer, and spend their winter months in this valley. 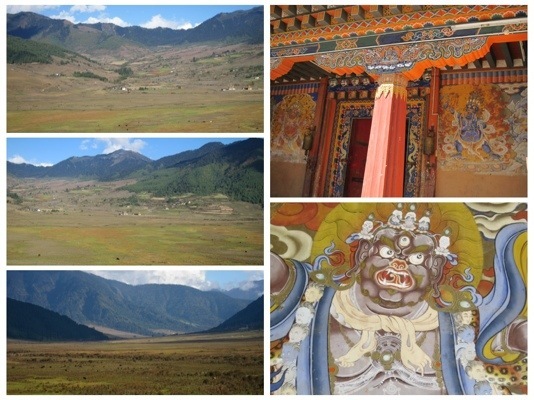 On a hill with a narrow country road leading to it, we visited the Gangtey Monastery that overlooks the wetlands and is surrounded by subsistence farms and distant natural forests. 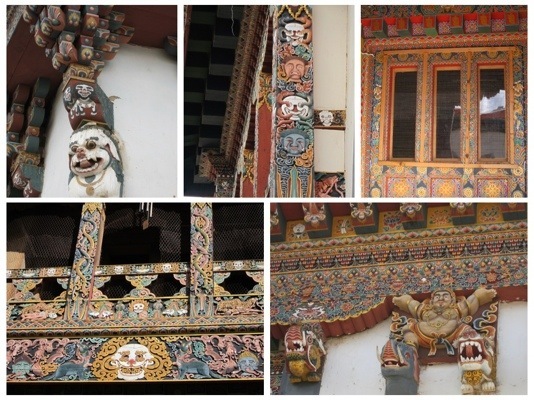 The monastery was completely rebuilt after a fire, and the new wood carvings are breathtakingly beautiful and very elaborate. 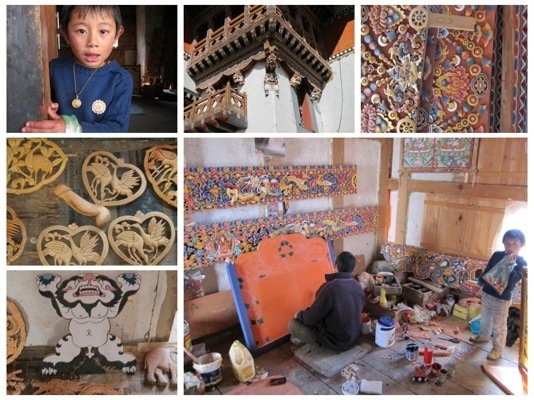 The corners of the tall building are inlaid with huge carved birds and the main temple hall is surrounded with little rooms, each serving as a residence for the young monks. On the road to our hotel, we stopped to ask for directions from the local highlanders. The mothers walked between fields dotted with cows, carrying large baskets, or young children, wrapped and tied to their backs. The look of people who have calm and quiet minds, that adhere to a religion that views anger as a sin to overcome, and never nourishes it or expresses it towards others….. Their eyes and faces had the reflection of minds that are not judgmental, not cynical and NOT constantly occupied. Our hotel room was large, made of local wood and overlooked this glacial valley. When we checked in, we were told that there was a power outage all through the valley. This meant that we would have no hot showers and no lights. We had with us some flashlights, and the hotel gave us extra candles. We knew that the hotel had its own generator, since the valley’s power supply often gets cut off. When we checked in, it seemed as if we were the only guests in the hotel, and we naturally assumed that they did not want to run the generator for just one room. The hotel staff helped us build a fire in our room, and our room got toasty. We laid out on the edge of our bed our warm clothes for the night, expecting a dark and cold night. When the sunset covered the valley in red and black tones, a large group of silver haired Canadians checked into our hotel. Their appearance brought the blessing of a roaring generator, and soon the power was restored as well. That evening in the hotel’s dining room, the atmosphere was jubilant with laughter, heat and warm food. That night Jules was unable to sleep, with a severe stomach bug that he had caught the night before and which would prove to stay with him, for two more nights. 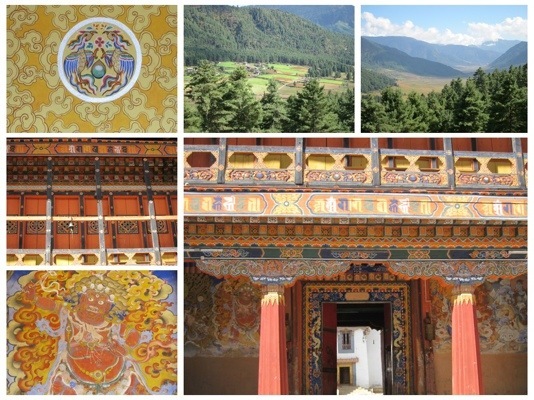 From Phobjikha we drove up some mountain passes and down again to the valley of Bumthang. It was a long drive which meandered through the mountains on a narrow road which was washed out in many places. The only road cutting through the mountains, it is relatively new. 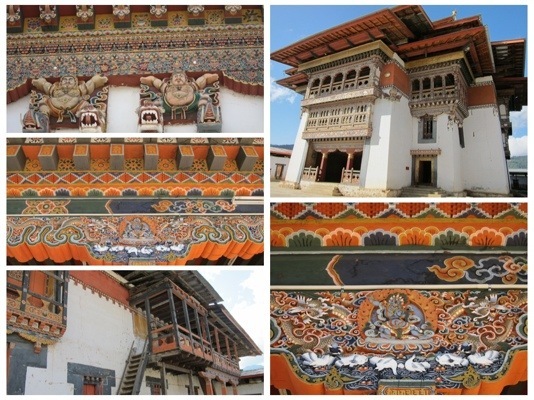 Before it was constructed there was no way to motor from western Bhutan to the Central and Eastern parts. 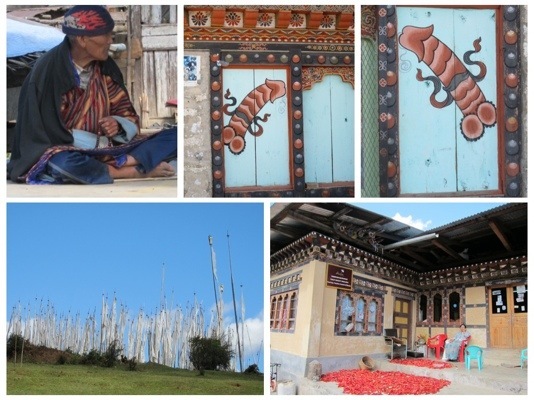 It was a beautiful drive and we passed through some dramatic views of yak herders, and high villages with farmers growing corn, turnips and radishes. We saw lush forests, and many beautiful and tall waterfalls crashing over mossy rocks with ferns and vines. 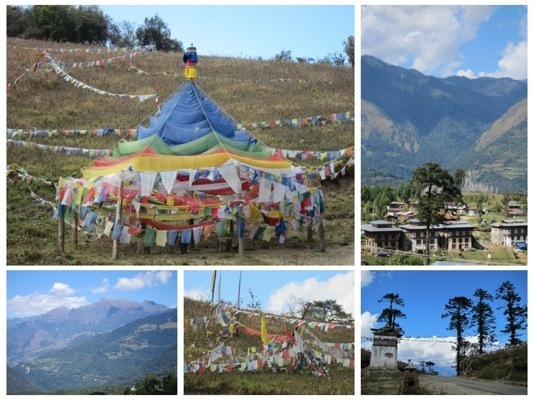 Prayer flags and a stupa dotted every mountain top and every pass. 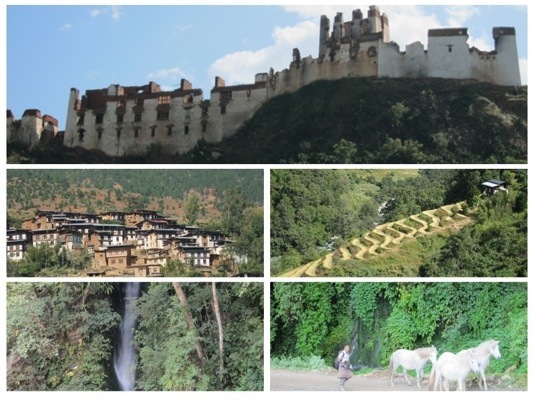 Our driver always passed the stupas clockwise, as if he were walking around it and not driving a car…. 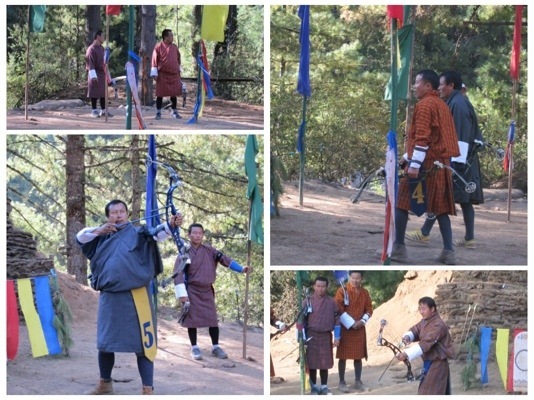 When we neared Bumthang, we stopped to enjoy an Archery competition. Bhutanese men are excellent with a bow and arrow, and every child grows up to participate in the sport. A few days before, we had seen some men play another national game called Kuru, which involves dividing into teams and throwing wooden darts. The archery competition was very impressive. While some Bhutanese still practice and compete with traditional bows and arrows made from bamboo, these were the professional archery tools with bows and arrows that were constructed from steel, and are perfectly balanced. Standing there by one of the ends, I could hardly see the tiny target from over 100 meters away (approx 300 feet). But alas one man did… He shot all three of his arrows into the target. Every time a team member hit the target, his team performed a traditional dance in front of the target. It was so charming to see those warriors in their traditional Bhutanese dress, sing and dance. Sonam told us that some people in these remote villages, do not have enough money to buy the professional bows and arrows. Sonam said that it was sad…. But they love the sport SO much, that they sell their land and all of their assets, in order to buy the bows and arrows. A professional bow cost anywhere from 50,000 – 80,000 Rupees ($1000 -$1700) and it must be imported from Europe or the USA. 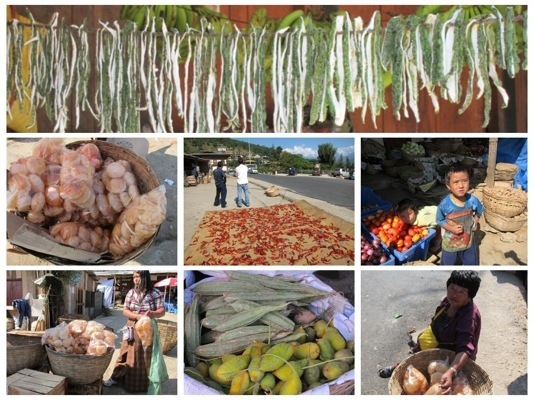 When we arrived in Bumthang, we went for a walk around town, and I bought a string of dried Yak cheese. This cheese is eaten dry. You simply put it in or mouth and munch on it. I also wanted to buy and take home some ceremonial props used in Buddhist rituals (called Pujas). These props, like the ceremonial bell and the thunderbolt cross, are depicted in all the traditional paintings and sculptures, held in the hands of many of the Gods and Deities, and those props are still used in Puja rituals of purification in monasteries today. Pujas are performed to assist the departed to find a new and blessed incarnation, on the occasion of weddings, to ward off evil and to bless newborns, etc. 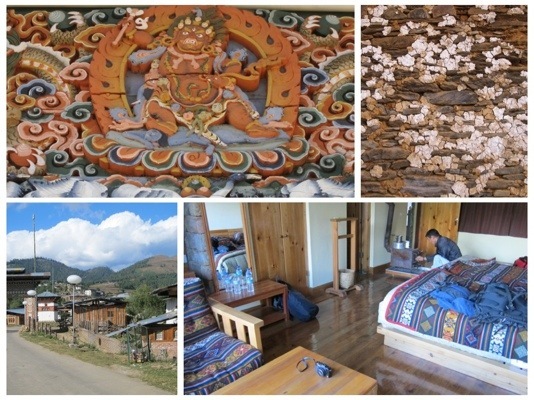 Our hotel in Bumthang is comfortable and our room is large and tasteful, with a good mattress and sheets, a shower that has lots of hot water and the best treat of all…. It has three radiators which keeps the room warm and toasty in this chilly and windy valley. Over the river and across from our hotel, our guide Sonam pointed to a big mountain, nestled above the valley with the backdrop of the impossibly tall Himalayas behind it. 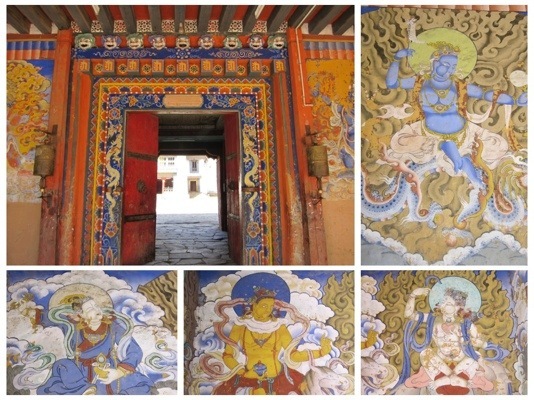 He told us the story of the famous treasure discoverer Pema Lingpa, who was asked to dive into a Flaming lake nearby, to find the treasure of Guru Rinpoche. 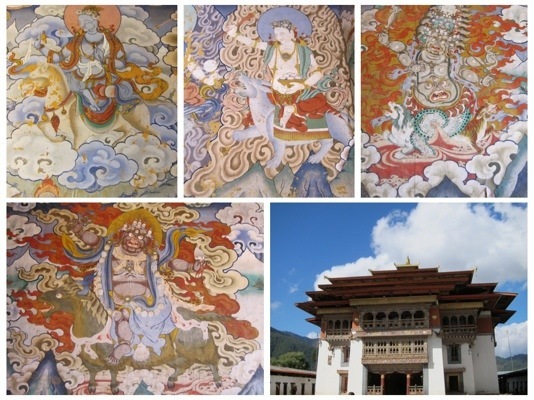 The treasure discoverer Pema Lingpa, is fabulously famous in this region and all over Bhutan. 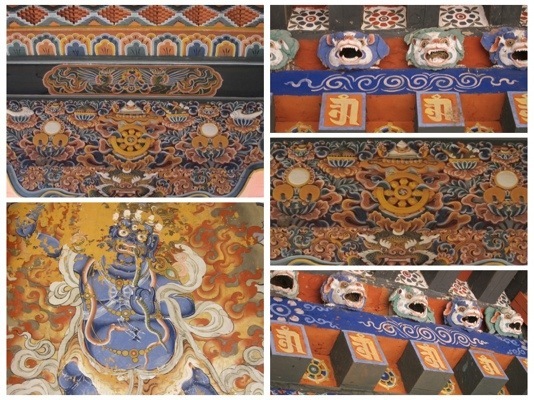 Many temple paintings feature his face, and large golden sculptures of his image, decorate many altars. In those times, a treasure discoverer was a real occupation, much like a pearl diver. It was also believed that masters and gurus were able to hide great treasures and important relics inside lakes or inside completely formed rocks, and that only certain people could see, invoke and find those treasures. Pema Lingpa dived into the flaming lake with a butter lamp which the story says, still burns in the depths of the burning lake. He only found a partially finished sculpture. The governor of the valley was an unreasonable man who was driven by power and hunger for more. 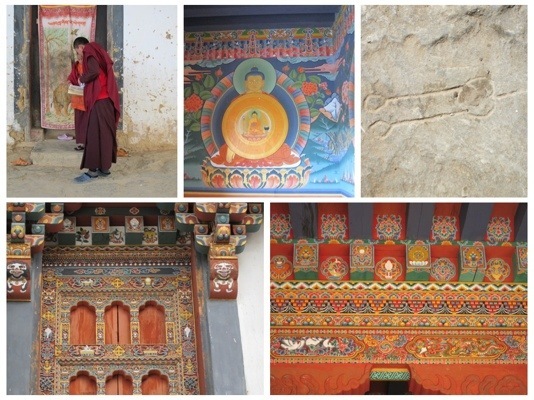 He got mad and angrily said to Pema Longpa that the unfinished statue, was NOT a treasure at all…. He pulled out his sword and cut the statue in half. The statue cursed the governor with losing all of his powers and losing his family fortune forever. Pema Lingpa who discovered the treasured prematurely, was cursed with a short life which will extend to all of his lineage. 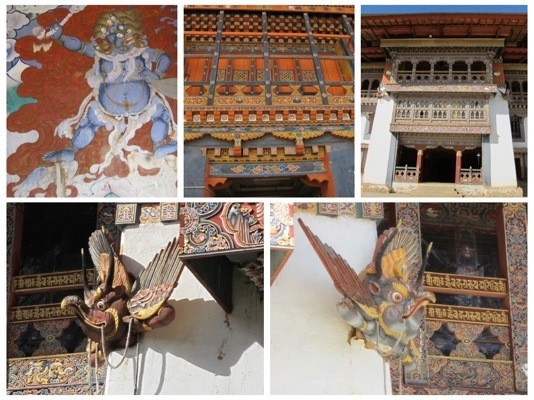 After the curse, the statue reformed itself, took off up into the air, and flew to the Eastern, remote parts of Bhutan. The mean and abusive governor issued an order for the people of Chhokhor Valley, to flatten the entire Badheya mountain and to turn it into plains. The mountain he wanted to flatten, was looming tall against our window…. Apparently….The people of the valley thought the same. They decided that it would be easier to kill the governor instead of flattening a whole mountain. They chopped him to pieces and peace reigned on the Chhokhor Valley again.